Our range of products include automatic boom barriers, automatic rising hydraulic bollards, electric boom barriers, boom barriers, bollards and rising bollads. Starting from 4mtr to 8 mtr. Boom Barriers serves the purpose of allowing individual passage of vehicles and regulating the entry and exit of vehicles. Its reliable mechanism & Compact control unit designed to meet wide range of industrial, Commercial & Residential application. Automatic rising bollards are ideal used where utmost safety and efficiency is required to restrict mainly vehicle entries. They are manufactured to withstand high impact collisions, and are commonly used on sidewalks, around homes, outside buildings and in parking lots. These are available in a variety of styles and finishes, cast iron, steel, stainless steel, recycled plastic, timber and concrete. Boom Barriers are the new age traffic control solutions for all sites that experience high frequency of vehicular traffic, the entry and exit for which needs to be controlled. Innovative Design and technological adeptness makes jet India expert in supplying and installation of all kinds of boom barrier in all types of surroundings. We have Boom barriers working on electromechanical and hydraulic principles with 100% duty cycle to ensure optimum performance with soft landing. The factors like frequency of traffic are taken in to consideration by Jet India’s engineers during the Site Visit before suggesting a boom Barrier. 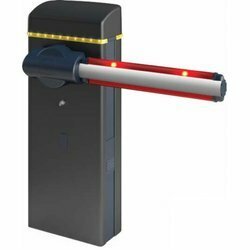 Boom Barriers can further be integrated with variety of Access control Equipment that make the movement of vehicle Simple, Safe and User Friendly. A bollard is a sturdy, short, vertical post. Although it originally described a post on a ship or quay used principally for mooring boats, the word is now used, primarily in British English, to describe posts installed to control road traffic and posts designed to prevent ram raiding and car ramming attacks. 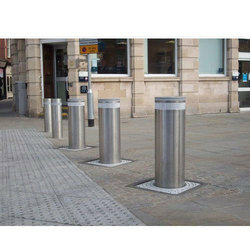 Bollards are used by government agencies and private businesses to protect public spaces, buildings, and the people in them from car ramming attacks They usually consist of a simple steel post either anchored to concrete, cored into a hard surface, buried in the ground or secured on a self-locking taper or impact recovery system to protect the surrounding foundations when a bollard is struck. Rising bollards are increasingly common around the world to hinder vehicle-based terrorist actions from achieving close proximity to buildings, and are also used to prevent vehicle-ramming attacks such as the 2007 Glasgow International Airport attack. They are also useful in mixed-use public spaces, which support both pedestrian use and emergency or service vehicle use. These bollards are Classified usually depending on their ability to resist ramming vehicles, based on speed. The Crash rated Bollards can stop vehicles at speeds of about 50 mph (80 km/h). 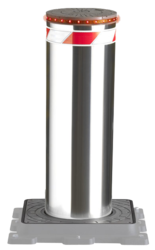 Bollards are perfect for all high security needs where a retractable option is necessary. For traffic control to limited access pathway, the bollard is the obvious choice for ease of use and economical, maintenance free operations. 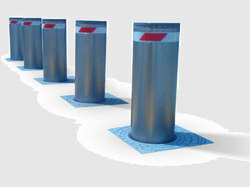 The bollards lift easily and locks in to place and just as easily can be retracted for pedestrian safety. The bollard can be embedded in concrete for simple and secure installations. Its clean and versatile design is highly visible with consistent Aesthetics that suits any modern building or landscape. High quality Mild Steel/ Stainless steel with Satin finish features high resistance to corrosion and weathering. 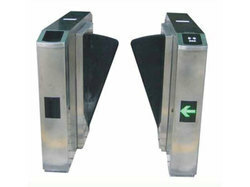 Flap Barriers are designed to control pedestrians entering or exiting security controlled areas. The standard model has an aisle (lane) width of upto 600mm. Flap Barriers can be used in Unidirectional & bi-directional control applications with high volume of pedestrian traffic. The outline of the product is formed after pressing the stainless steel plate. The shape is featured as pleasing in appearance, righteous, stainless and durable. The system is provided with a standard electric interface which is easily integrated into the product with read/write facilities. A special control system is quipped within the product to meet the requirement of fire control, so that the smooth passage flow is ensured, realizing timely diverting of passengers. The product is featured as stable, safe and reliable in performance and can be used widely in the places where passenger flow is high but monitoring is needed. Tripods are designed to control pedestrians entering or exiting restricted area in low to medium level of security generally, under some surveillances & Crowd control applications. The rotation is 3 X 120 degree (Tri-arm design) for bi-directional application with high volume and authorized personnel movement. Normally passage is to the left of the casework when individual units are used for entry or exit. The tripod can be arranged to open from a variety of local or remote input signal, such as coin mechanism, security control room, access control reader etc. Access Control reader/sensor can be mounted on the top of the cabinet on the slanting surface provided. The tripod arms are recessed into the cabinet ensuring that there is no obstruction to impede passage or sharp ends to catch clothing. 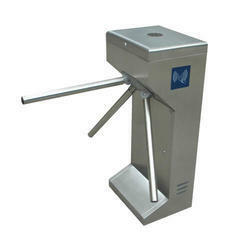 Turnstile are a form of gate which allows only one person to pass at a time. 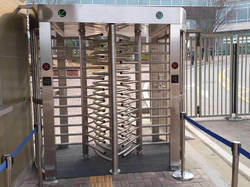 this enables security to efficiently prevent potential trouble or to restrict any prohibited materials to enter into any secured premises. readily be connected to pre-existing access control systems. capable to control the passage in both directions, with the option of single direction control with the reverse direction locked or free upon request utilizing a push button fixed to the upright. compatible with all types of ID readers and are available in MS and SS caseworks. 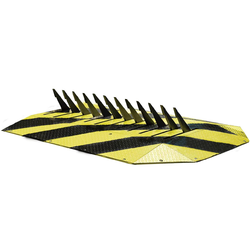 A Tyre Killer Barrier is designed for use in high security high traffic applications. The tyre killer barrier is a simple to install highly secure vehicle control barrier, ideally suited for approach entrances to banks, military installations, airports, docks, cash collection depots government offices etc. The tyre killer teeth retract below ground level when a signal is received from the push button or integrated access control unit providing safe access or authorized vehicles. When the vehicle has passed, the teeth return to the active position, ensuring total protection from unauthorized vehicle intrusion. 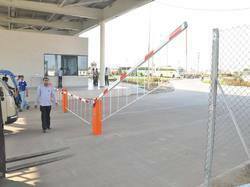 Tyre killer barriers may be used with any type of access control system. We recommend that the Tyre Killer is used in conjunction with a rising arm barrier and an underground inductive detector loop to act as a safety device to prevent the barrier operating when an authorized vehicle is stationary over the teeth. Looking for Main Entrance Solutions ?